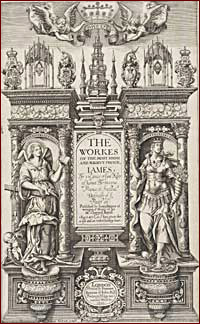 Title pages from James's collected 'Workes' (1617): topics include theology, politics, witchcraft and smoking. The man who lies behind the Union of the Crowns has been seen in different ways. Some historians accuse James of being a self-indulgent character dependent on young male favourites and over-fond of drink. Others point out that he governed Scotland with great success, worked for religious peace in Europe, and supported two great cultural movements – the revival of Scots poetry and the rise of the English theatre at the time of William Shakespeare. His books are now increasingly read again by historians and scholars, following a reappraisal of his works and reputation. Sometimes James's opinions seem shocking to us – his approval of burning heretics; his assertion that the only authority over him was God – and sometimes rather bizarre – for instance, his order that the lower classes should not be allowed to play bowls. In other areas, he seems to have been ahead of his time – warning against passive smoking, cultivating friendships with Spaniards, and calling for the protection of forests. During James's reign the British colonies in North America became well-established: the Jamestown assembly met in 1619, and the Pilgrim Fathers arrived on the Mayflower in 1620, leading to the development of an organised English-speaking community. Popular stories about James abound: his practice of urinating on horseback has passed into legend. On a more pleasant note, many people think he wrote the Authorised Version of the Bible: in fact he commissioned it. Each year on 5 November, firework displays commemorate James's escape from being blown up in the Gunpowder Plot. 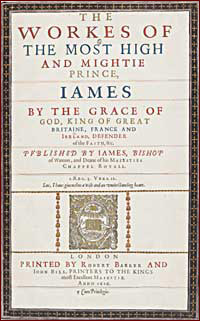 Love him or loathe him, James is crucial to the story of Britain.